Monte Solaro, soaring 589 meters above sea level, is the highest and most panoramic point on Capri island. Here the view extends across the whole of the island of Capri, the surrounding Bay of Naples, the Amalfi Coast and as far as the distant mountains of Calabria. Locals often refer to Monte Solaro as the "Acchiappanuvole" or "cloud catcher" after the thick blanket of fog which forms around the summit, especially at dawn. Visitors can take the chairlift to the summit or even chose to walk up to the jaw dropping views. The easiest way to get to Monte Solaro is by chairlift. 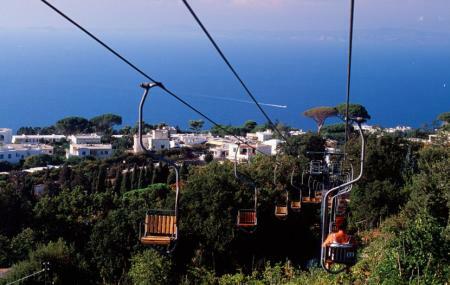 The journey to the summit of Capri's mountain takes just 12 minutes by chairlift. Take the chairlift from Piazza Vittoria in Anacapri. If you decide to walk up to the summit, it will take you anything from an hour or an hour and thirty minutes. How popular is Monte Solaro? People normally also visit Marina Grande while planning their trip to Monte Solaro. Incredible views. There is a little bar upstairs where you can grab a little snack and a spritz. There are also chairs where you can enjoy your snack along with the views. Highly recommend the trip. The chair lift takes 13 minutes and I highly recommend this to get up to the top of the mountain. Highest point on the whole Island of Capri. You NEED to visit while you're here. From the port, take a bus/taxi to Anacapri, then walk to the chairlift and ride up. The photos are incredible and memories of the views will never be forgotten. There's even a restaurant at the top if you're in the mood for a drink once you make it to the summit. We had so much fun going up the mountain with the cable-chair. Views are amazing from the top and a return ticket is very well priced. There are queues but they move considerably fast. Well worth the visit. Incredible Views, Worth going up and paying! Simply amazing, incredible views. One of the highlights of my trip. Would highly recommend. A boat ride around the island afterwards is well worth it too for closer looks at what you saw from the mountain top!